As Wilf Wooller, the commentator for BBC Cymru Wales joyously regaled fortunate viewers “ it's gone way down to Swansea!”, little would he have known that a legend, other than history being made of course, would be born on that day in the summer of 1968. One of the world’s greatest cricketers and ambassadors, Garry Sobers, became the first man to hit six sixes in one over from a man who would become one of Glamorgan’s stalwarts, Malcolm Nash. 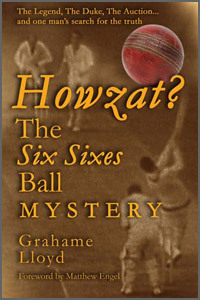 In a previous book, Six of the Best: Cricket’s Most Famous Over, Grahame Lloyd had celebrated Sir Garfield Sobers’s feat but this book reveals the subsequent auction of a ball, deemed to have been hit by Sobers during the historic over, which was sold for £26,400 (including the buyer’s premium); an auction which appears to have been riddled with inaccuracies. Via an at times convoluted journey, a Duke ball reached Christie’s in 2006 and was sold for almost three times its original highest estimate and ended up in India. As Glamorgan in 1968 used balls supplied by Stuart Surridge, there was a clear discrepancy and Grahame Lloyd took it upon himself to find out the truth. His relentless journey brought him in touch with the two main players in the eventful over as well as Christie’s, and another auction house, Bonham’s, who accepted Lloyd’s compelling evidence, and stopped a subsequent re-auction of the same ball. Caveat emptor are two words which spring to mind. Lloyd, a freelance broadcaster and journalist in not just cricket over thirty years, could well add sleuth to his CV after expending a lot of time and energy into tracing the truth behind the ball auctioned at Christie’s. His was a simple desire to obtain the truth and which became a process which turned out to be anything but simple. Tracing the ball to India after an antiquarian book dealer had bought it on behalf of a client in Delhi, the Indian client did not collect the ball after it was kept at Delhi International Airport because a further tax had to be paid for its import. The ball was subsequently re-auctioned via a Delhi Airport’s auction system for unclaimed goods and the new owner paid a snip of what his fellow countryman had paid. Lloyd painstakingly tracked down all the participants – many of whom seemed less than anxious to assist and he came up against a lot of procrastination from the new owner – in an attempt to reveal the truth but ultimately the ball was not returned to England for there to be a chance of the monies being refunded. There must be great admiration for Lloyd’s determination and persistence in seeking the truth and for devoting eighteen months to taking on a topic which had every possibility of being an awkward one. This is not, I believe, the first instance of a ball sold at an auction being questioned. Was not the Headingley 1981 ball with which Bob Willis ran through the Australians on the final day, also subject to dispute? Cricket has a wide range of fascinating subjects and this will surely add to the list. So, the ball which sailed out of the St Helen’s ground in Swansea into a St Helen’s Avenue from the sixth ball of that famous over, remains a mystery. The ball which travelled as far as India is more well-known but this book – and additionally Grahame Lloyd’s earlier book on the historic over – should interest all types of person interested in cricket and will doubtless add awareness to anyone interested in collecting memorabilia.